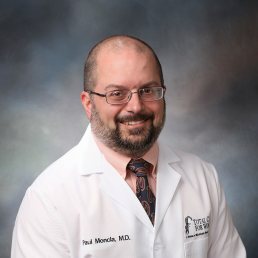 Dr. Paul Moncla earned his medical degree at the East Carolina University School of Medicine in Greenville, NC. He completed his Obstetrics and Gynecology residency at the New Hanover Regional Medical Center in Wilmington, NC. He is a diplomate of the American Board of Obstetrics and Gynecology. After residency, Dr. Moncla was stationed at Nellis Air Force Base in Las Vegas,. He provided OB/GYN services to active duty personnel, their dependents, and retirees. In 2005, he separated from the United States Air Force and returned to his hometown, Elizabeth City, NC. Dr. Moncla enjoys spending time with his wife and four children.